You can find a complete set of photos from this trip here. One of the most interesting tourist railroads in the country started operating in 2013. Called "Steam Into History," the line operates on the old Northern Central (a subsidiary of the Pennsylvania Railroad). The original Northern Central connected Baltimore with Sunbury, Penn. ; today's tourist operation runs on only a small piece of that trackage, between the Pennsylvania towns of New Freedom and Hanover Junction. The line is historically significant in that it was used by President Abraham Lincoln in 1863 when he traveled to Gettysburg to deliver his famous address, changing trains at Hanover Junction. 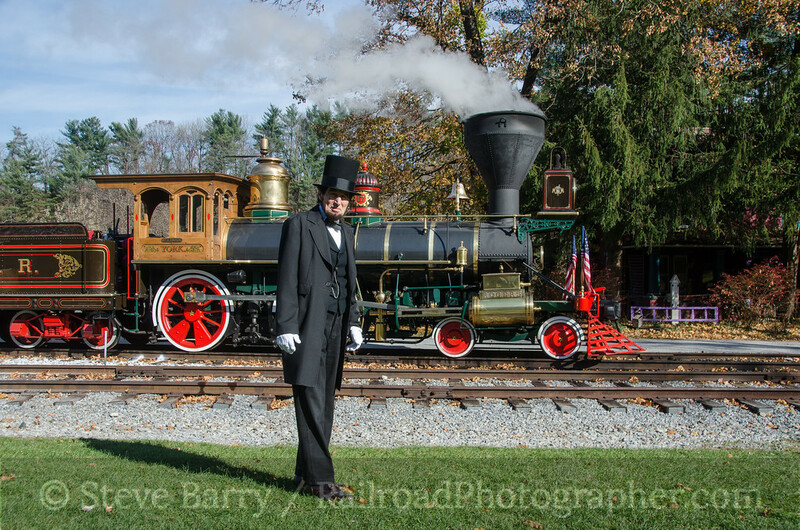 Steam Into History has tried to capture some of the feel of railroading in Lincoln's day. 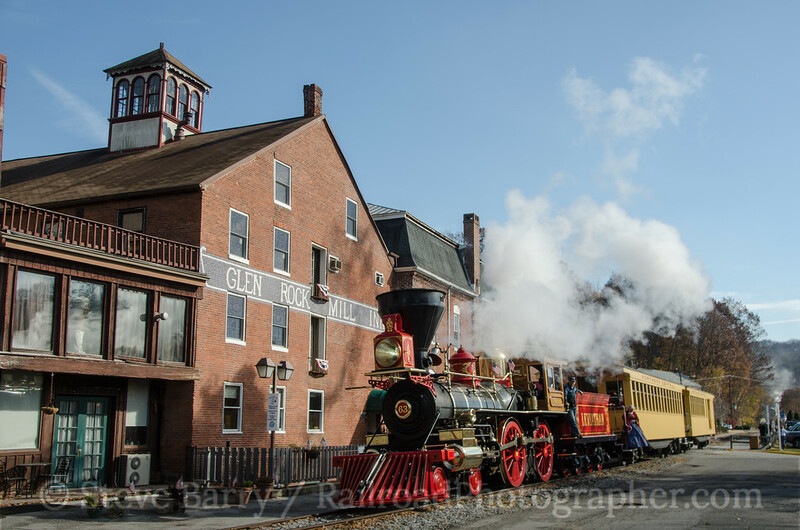 The locomotive is a brand new replica of an 1860s 4-4-0, the York, constructed by Klocke Locomotive Works in 2013. While it sports a balloon stack typical of woodburning locomotives, the York burns fuel oil. Leviathan at Glen Rock, Penn. In mid-November the York was joined by a sister locomotive, Leviathan, which was built by Klocke in 2009. The two were together for a week in Pennsylvania. It wasn't the two locomotives together, though, that got me out to New Freedom. Instead, it was the fact that the rides have been so popular that Steam Into History had to add some night runs. This intrigued me. Thus, on November 16 I headed out to New Freedom. Trips with Leviathan had been scheduled from the previous Saturday through Wednesday, with nothing announced beyond that. Thus I was pleasantly surprised to find Leviathan on the northbound end of the morning train to Hanover Junction. York followed a few minutes behind, and would couple on to the south end of the train for the return trip. The procedure was supposed to be repeated for the afternoon trip, but pesky air brake proble,ems that had plagued Leviathan all week caused it to be pulled off the train just a mile or so out of New Freedom. Alas, it would not be used at night. At Hanover Junction I wandered in to see the festivities. The station where Lincoln changed trains is still standing (a Matthew Brady photo shows Lincoln at the station) and the building has been nicely restored. I had not looked at a calendar, but somehow I had managed to time my visit to be just two days ahead of the 150th anniversary of Lincoln being here; he changed trains at Hanover Junction on Novemeber 18, 1863. The train had a few people in period garb, including Civil War soldiers, but the person who stole the show was the actor playing Lincoln. 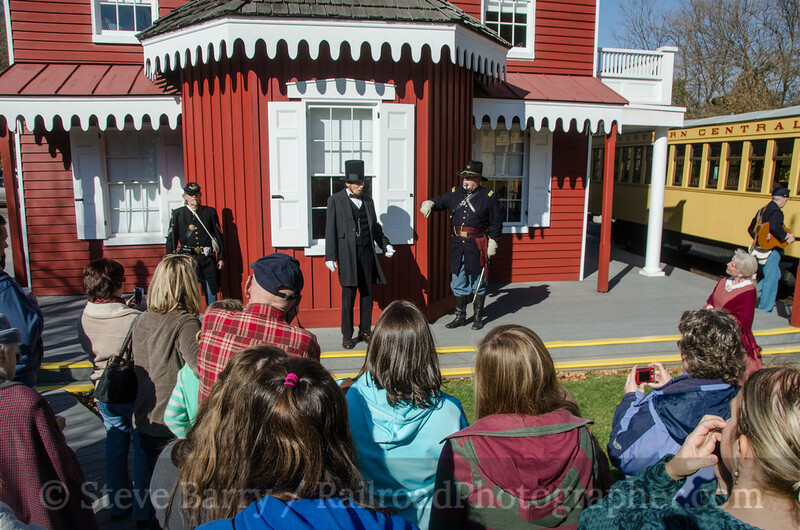 He addressed the crowd at Hanover Junction as if it were that day in 1863. He explained that he was on his way to Gettysburg to deliver an address the next day, and if the crowd didn't mind he'd like to rehearse his speech. He then delivered an excellent rendition of the entire address. I had read the speech a million times, but to hear it delivered by Lincoln gave me chills -- it was really impressive. As the day wound down, I broke out the flash units for some night shots. 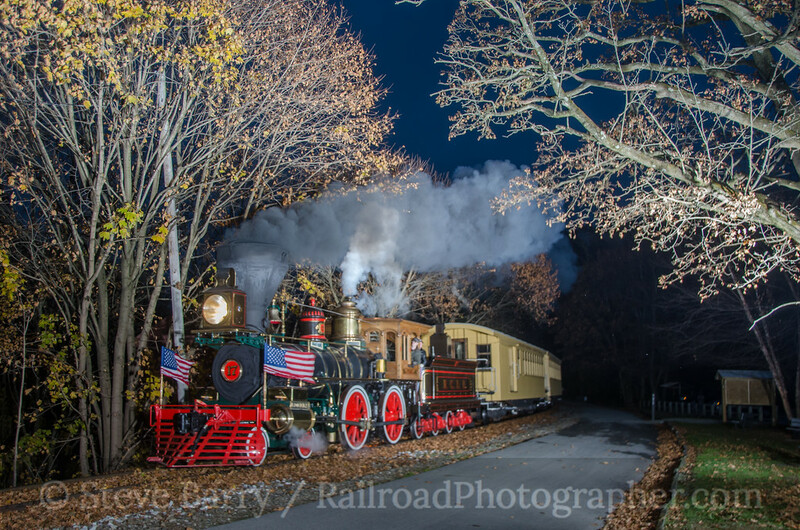 With the short days, the afternoon train came back south after dark and I was able to shoot it at the town of Railroad. 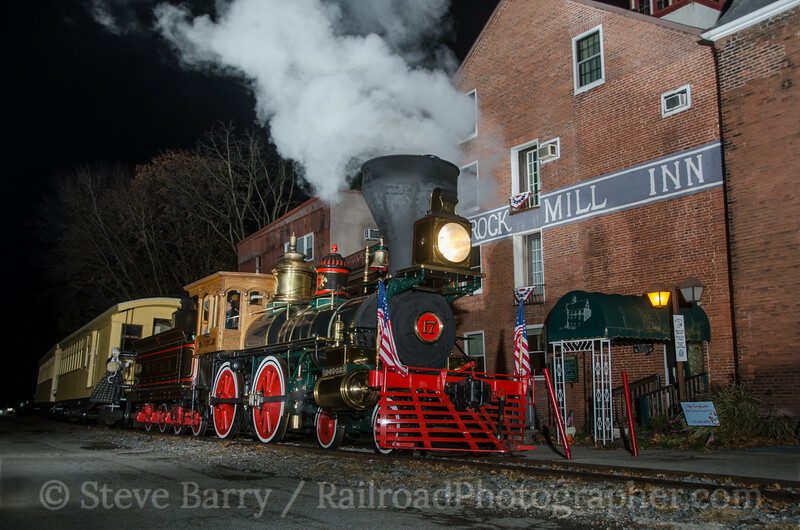 The night train provided shots at Glen Rock (where an impressive brick mill is now a restaurant) and passing the hotel back in Railroad once again. I cannot say enough about the Steam Into History operation. 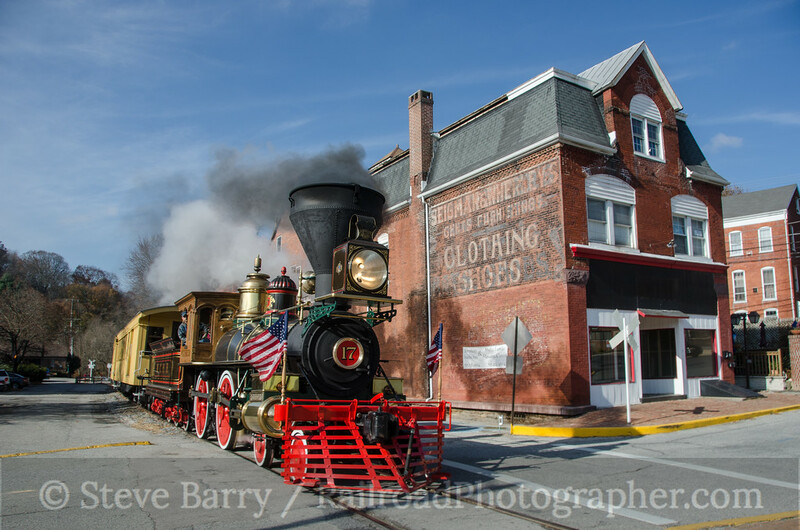 From its locomotive to its quaint coaches to its above-average living history, it is really a great heritage railroad. I look forward to returning someday and shooting more with the York.